Creating video games could be your next job. Villa Maria College will provide the degree. Video games have been around for more than 40 years and are as popular as ever. 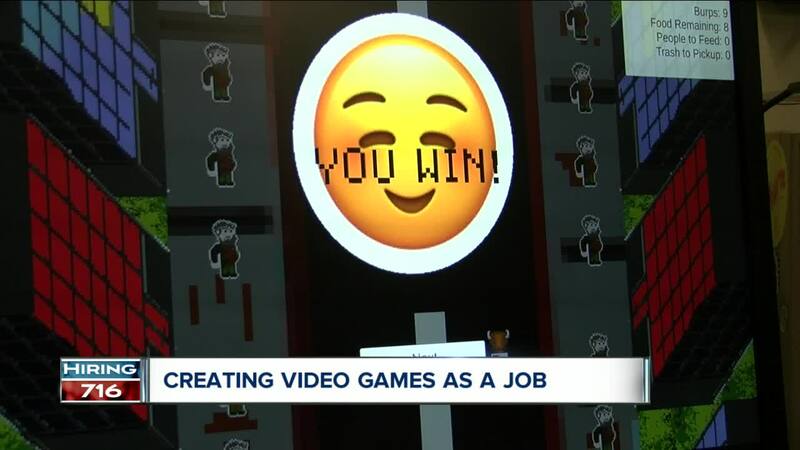 BUFFALO, N.Y. (WKBW) — Video games have been around for 40-years and are as popular as ever. With the new developments in technology, Chris Langford, a computer software developer says it is easier than ever for someone to start creating the future of gaming.
" Making video games involves every single creative medium that already exists," Langford said. He creates games and works on augmented reality at the Buffalo Game Space in the Tri-Main Building on Main Street. The non-profit helps build the video game scene in the Queen City. "The games industry is larger than both the movie and music industry combined," Jeffery Werner, Instructor of animation at Villa Maria College said. "A lot of growth and opportunity there." The Department of Labor estimates that the computer software development industry will grow 24-percent and the need for video game designers will grow 10-percent in the next decade. With the expected growth mixed with the interest from students, Villa Maria College is adding two new majors-- one in computer software development and another in video game design. Werner is one of the instructors that helped make the curriculum for the video game design program. He says classes will teach students the nuts-and-bolts of spftware programs but also the importance of entertaining design. Classes will begin in the fall of 2019 and students can start enrolling now on the Villa Maria College website .